Open your mouth wide, leaving your lips relaxed. Place the harmonica between your lips so that the front of the harmonica touches the right and left corners of your mouth, where your upper and lower lips meet. Let your lips drop onto the harp so they form a cushion that lets the harp slide when you move it to the left or right. The cushion should be relaxed, but it should also form an airtight seal with the harp. With your lips on the harp, inhale or exhale gently. You should hear a chord (several notes sounding at the same time). As you play, let the harp slide forward as if it’s slowly slipping out of your mouth, and press the corners of your mouth inward to help keep an airtight seal between your lips and the harp. Your lips will make a smaller opening as the corners of your mouth get closer together — it may feel like you’re pouting. As you continue to breathe through the harp, you should hear fewer notes; it will sound like less overall sound coming out of the harmonica. To isolate a single note, you may have to push your lips forward a little more — be especially pouty (like your kid sister used to). Keep your lips as relaxed as possible while maintaining an airtight seal. As you work on the pucker, listen for air escaping around your mouth. It will make a sort of hissing sound. To ensure that all the air from your mouth goes through the harp, pay attention to the sides of the hole you’re playing and make sure to seal it with your lips or the corners of your mouth. Don’t clamp down on the harmonica with your lips. Doing this just causes fatigue and also prevents the harmonica from sliding to the right or left in your mouth when you need to move to a different hole. You may need to move the harp a small amount to the left or right to line up a hole on the harp with the hole in your mouth. If you aren’t quite getting a single note, experiment by sliding the harp just a little as you push your lips forward. The farther you can get the harp inside your mouth and still get a single note, the better the harp will sound. 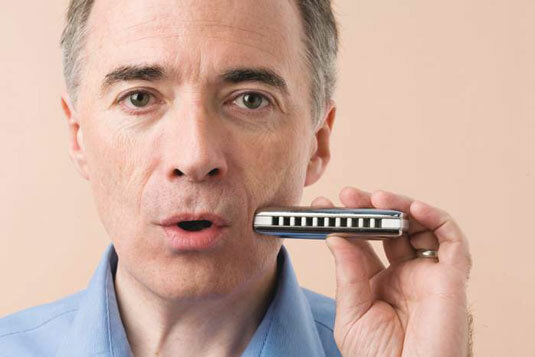 After you get a single note, try pushing the harmonica a little farther back inside your lips. The harmonica should always be in contact with the moist inner parts of the lips. It should never feel like the harmonica is pressed against your lips from the outside. A relaxed, airtight seal with a full-sounding tone takes time to achieve, but don’t hesitate to make it a goal.